What’s the Golden Rule of Sewing and the most commonly missed step when getting ready to sew? Threading with your presser foot up!!! Zede feels this is the most neglected information when teaching/re-teaching someone to use a sewing machine. She notes it’s also the most important thing to teach. Zede and Mallory find it interesting when they give a refresher lesson to those who have not sewn in a while and emphasize how important it is to thread with your presser foot up that this seems so foreign a concept to people. 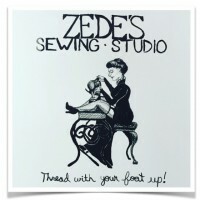 Something Mallory hears a lot when people come into Zede’s Sewing Studio to get their machine serviced is how their machine is bird nesting or they are having bobbin issues and they seem very confident that the problem must be the bobbin tension. Mallory says some people get very offended/bewildered when she asks if they thread with their presser foot up. This is a routine question at the shop because many times when a machine presents with these issues it’s because the machine was not properly threaded. What happens when you raise your presser foot? There are two metal discs in the top of your machine called tension discs. Thread from the spool is placed through the guide on top of the machine and this thread is brought down through a slot in the front on the machine. In this very narrow slot are the tension discs. These discs look like two metal cymbals; if you look close enough you may be able to see them. On some older machines (mid-century to the early 1990’s) you may see them on the outside of the machine. When you lift the presser foot these discs open up and the thread is allowed to pass freely between them. When you lower the presser foot the discs come together and secure the top thread giving the thread proper tension for sewing. Sometimes you luck out and the thread will go between the discs when you don’t raise the presser foot. Don’t count on that always being the case. Always raise your presser foot to thread the machine properly. When there are inconsistencies in machine performance it is usually OE – operator error. This is not 100% of the time, sometimes the machine will have electrical or other issues not caused by the operator but many times it will be OE. 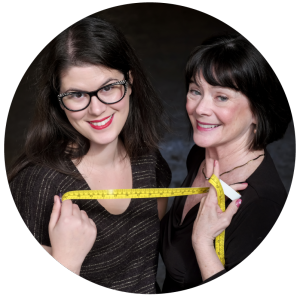 Have you ever wanted to take a sewing class with Zede or Mallory? Well that experience is just a few clicks away. 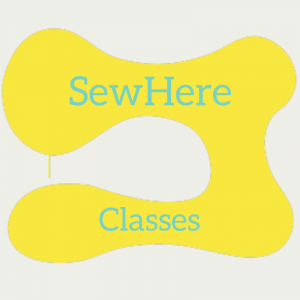 Got to SewHere.com/classes to see our online class offerings like the Easy T or the Made to Measure Leggings classes. When you buy from us you pay once and have access to it forever after. What can happen when you thread with your upper tension discs closed and you try to sew? Many times the machine will bird nest in the bobbin area (wads of thread will build up in the bobbin case area because tension is unregulated) or the machine will shred thread in the tension disc area and thread trash will get caught and cause future problems. What can you do if you suspect a tension issue? The first thing to do is unthread your machine correctly. Start by raising the presser foot, clip the thread close to the spool, gently pull the thread out of the needle eye and in the direction of threading, now pull the thread out above the needle. Rethread the machine properly (raise that presser foot!). Something as simple and quick as rethreading can completely change the game. Changing your tension when the thread isn’t even in the tension discs will not fix the problem you’re having, in fact it could make it worse. If you have bird nesting, thread looping or thread trash underneath your project it is actually a top tension issue. So if you have top thread looping or thread not going to the bottom it’s a bobbin tension issue. This thread build up of unregulated thread tension can cause your bobbin to jam up, you could puncture your drop in bobbin case, get shredded threads, or possibly bend/break your needles. These issues can have you headed to your local machine dealer for costly repairs which could have been avoided had you threaded with your presser foot up. Mallory and Zede note that you may need to check and clean out the bobbin area after you rethread. You may also want to use an index card or unwaxed dental floss (very important, no wax) to clean out opened upper tension discs. If your machine is still not making proper stitches a trip to a repair shop may be needed.